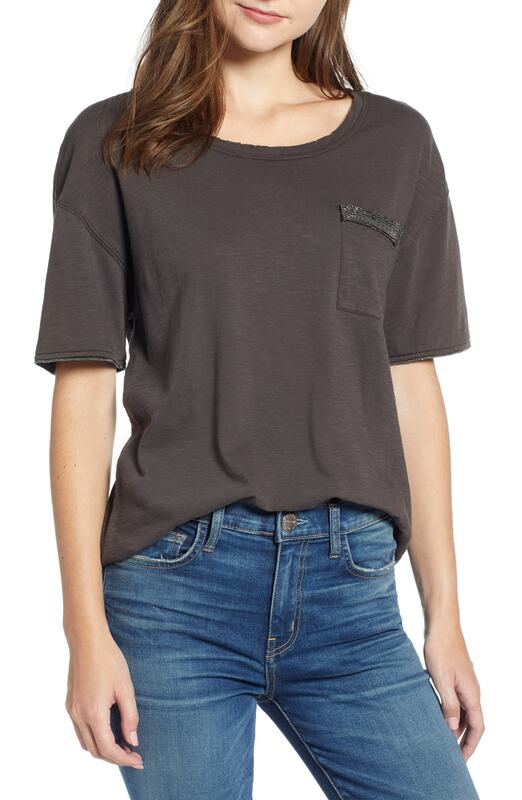 If you're searching for a casual yet chic outfit, pair a charcoal crew-neck t-shirt with navy skinny jeans. Both pieces are totally comfy and will look fabulous paired together. When it comes to footwear, this look is finished off wonderfully with black leather ballerina shoes. If you're on the hunt for a casual yet totally chic look, go for a Splendid embellished tee and black skinny jeans. Both garments are totally comfy and will look fabulous together. Amp up the cool of your outfit by complementing it with black cutout leather ankle boots. If you're on the lookout for a casual yet totally stylish look, rock a Splendid embellished tee with blue skinny jeans. Both garments are totally comfy and will look fabulous paired together. When it comes to shoes, this outfit is round off nicely with grey snake leather wedge sandals. If you're a fan of relaxed dressing when it comes to fashion, you'll love this adorable pairing of a Splendid embellished tee and navy ripped boyfriend jeans. Rocking a pair of tan leopard pumps is a simple way to add extra flair to your look. If you're obsessed with functionality dressing when it comes to fashion, you'll love this chic combination of a Splendid embellished tee from Nordstrom and a gold skater skirt. A pair of silver leather pumps adds some real flair to this ensemble. If you're after a casual yet absolutely chic look, try pairing a Splendid embellished tee with yellow denim shorts. Both items are totally comfy and will look fabulous paired together. When it comes to footwear, this outfit is complemented wonderfully with black leather knee high gladiator sandals. If you're obsessed with relaxed dressing when it comes to fashion, you'll love this extra adorable pairing of a Splendid embellished tee and blue ripped boyfriend jeans. Up the cool of your look by rounding it off with black suede pumps. If you're on a mission for a casual yet totally stylish getup, rock a Splendid embellished tee from Nordstrom with black denim shorts. Both items are totally comfy and will look fabulous paired together. 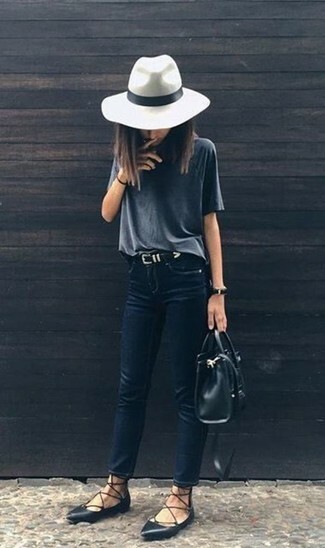 If you're all about functionality dressing when it comes to fashion, you'll love this absolutely chic pairing of a charcoal crew-neck t-shirt and black ripped skinny jeans. Rock a pair of black suede loafers to va-va-voom your outfit.